← Follow the money: find it first. Happy birthday, Rosa Parks! Born on February 4, 1913, Parks was not a tired old lady in 1955, when she refused to move to the back of the bus. She was an experienced and committed activist, deeply tied into the civil rights activist networks. She wasn’t the only one who took a risk to challenge segregation laws in the South, but that hardly makes her less heroic. 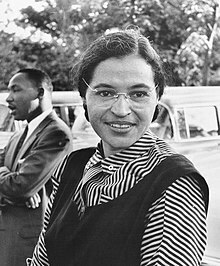 Activism in the civil rights movement was hardly a career move for Rosa Parks; her recognition as an American hero came eventually. In 1996 President Clinton awarded her the Presidential Medal of Freedom.